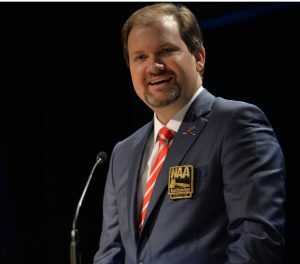 COLUMBUS, Ohio (July 26, 2017) — Tennessee auctioneer Tim Mast has been elected vice president of the National Auctioneers Association, the world’s largest association of auction professionals. The election places him in line to become president in July 2018. Mast, of Selmer, Tennessee, was elected at the NAA’s recent Conference and Show in Columbus. An 18-year veteran auctioneer, he is executive vice president of Tranzon Asset Advisors. By tradition, the vice president is elected by acclamation to the presidency in the following year. “It’s really a huge honor to be entrusted with this responsibility by my peers. I’m overcome with gratitude and determined to do my very best to serve the industry,” said Mast, who has served on the NAA’s Board of Directors for three years. Mast also has served as president of the Tennessee Auctioneers Association. In 2013, he became the youngest auctioneer ever to be named to the Tennessee Auctioneers Association Hall of Fame. Mast is the second Tranzon official to be elected vice president. Previously, Tranzon Auction Properties President Thomas W. Saturley served in 2014-2015. “Tim has earned the respect of our auction industry peers through his hard work on behalf of NAA, his many professional achievements, and his commitment to the highest professional standards. Most recently, he served as chair of the Promotions Committee, which raised awareness of the auction method and the importance of selecting NAA professionals,” said Saturley. In addressing the convention, Mast said it is time for the NAA to engage its membership at a higher level and to address long-term plans as the organization approaches 2020, the goal for the existing Pathways to 2020 strategic plan. Tranzon Asset Advisors, based in Elizabethtown, Kentucky, is part of the Tranzon network, selling high-value real estate assets throughout the United States with more than 27 partner offices. Mast may be reached at 888-791-7307.